Birmingham took some big steps in the later Victorian era to provide amenities to its growing industrial population. One such step was the creation of the Edgbaston Waterworks Company in 1826 to supply clean water to residents from local rivers such as the Tame and the Bourne. In 1870 the famous ornate chimney designed by John Henry Chamberlain was completed. The buildings at its base contained two pumping engines. The Industrial Revolution had brought grim chimney stacks to the skylines of many English towns and cities. Chamberlain’s design concealed the functional chimney within a tower of decorative brick in the pattern of a campanile, a renaissance bell tower. Birmingham Corporation bought the waterworks in 1876 with the promise of supplying clean water for the health and comfort of its citizens without making a profit from them. Those citizens continued to increase in number and local rivers and wells could no longer supply their needs. The famous Elan Valley project began in 1892 to bring water from Wales. 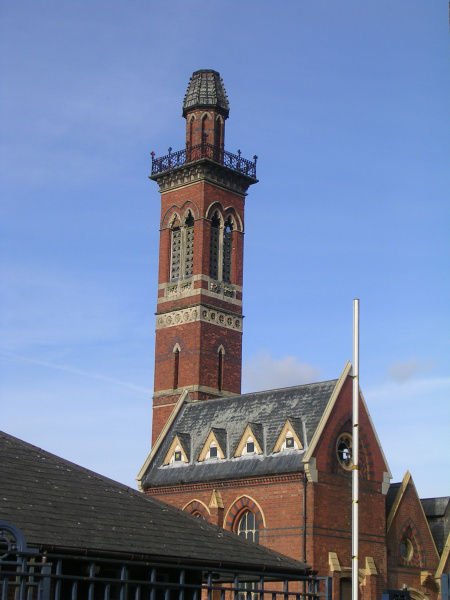 The Waterworks Tower gained fame not for its actual purpose but for the widely-held belief that it inspired JRR Tolkien’s Twin Towers with its nearby neighbour, Perrott’s Folly. Young Tolkien would certainly have seen the pair as he attended school at The Oratory but he never confirmed the connection.